Being the sequel to one of the most revolutionary games of the story is not a simple task. Fortunately, the time is wise and, over the years, fans cast look back and could reassess Odyssey Link for land Termina as it deserves, ie, without prejudice or comparisons, at the game automatically went on to become a cult. And no wonder, since 15 years later and Nintendo 3DS, the magic of Majora's Mask is still intact. Or what is the same: it's still a great game that no one should lose under any circumstances. If you never got a chance to play Nintendo 64 version, you simply have to know that its story continues the events of Ocarina of Time, Link seeking Navi with the forests of Hyrule. However, this journey is soon twist and a series of events eventually dragging us to the land of Termina, a parallel to Hyrule world threatened by a giant moon with a sinister face threatening to hit the ground and destroy everything in just three days, something we should avoid at any cost. As you can guess, this time is insufficient for such a task (especially considering that one hour of Termina equivalent to a real minute), but fortunately we are the Hero of Time, so we have the power to go back to the first day whenever we want . In this way, we will be playing relive again and again these fateful 72 hours to prevent the moon fall and give us more time to find a way to stop the impending doom looming. Translating playable level, this means that we are always playing against time, pressure and constantly reminding us of what little life he has left the world and the next thing is its end, either with a clock that advances tireless, with tremors every hour on the final day, with the bells that warn us that we have run another day and so on. Moreover, returning to the first day, all you have done so far will be lost. Luckily, the game has a sublime design and extremely well studied that provide us all kinds of shortcuts to have it not repeat everything again and so save time. For example, if a dungeon let half but you able to get to the object (the back consumables are lost, but not the tools or masks) who was inside, using it the next time you return will advance to speed through it to get to the same point in which you left without return it to repeat all or invest the same amount of time. This is something that applies to all the adventure, so you always have the feeling of moving and gradually increase your mobility Termina without you punish too by going back to the first day (although this does not make you free to repeat more than one activity, especially if you manage to get to the key points). One of the most fascinating of these mechanics and have most helped Majora's Mask is on Olympus video game development is found in the 72 hours that have these aspects. As time passes, all the inhabitants of Termina continue with their lives, following routines and participating in specific events that can intervene and participate. It is perfectly possible to select any of the characters in Clock Town (the main city of the game and the site on which invest more hours) and follow for three days to discover its history and how is living this desperate situation that they have to live. The interesting thing is that we can interact with them in many different ways, relieving their sorrows, helping them fulfill their dreams before the end, and so on. And to make it even deeper and more complex, we do a longer certain day time can influence another series of events that will occur (or not) later, discovering along the way all kinds of stories and reaching a point where we feel like we've forged a strong friendship with all people of Termina, although once we get back to the first day no one will remember us (things like the beautiful story of Anju and Kafei perfectly show how well this works) . Emphasize that this world is a little strange and sinister, with spirits everywhere, quirky characters as themselves (you can not expect less from the game that first appeared Tingle), the death lurking in every corner and a host of sad stories of loss and broken dreams. There is more to see how early in the game we want to imply that Skull Kid (the "villain" of the adventure) has killed our trusty horse Epona to realize quickly that will not be an adventure full of joy and happiness. Yes, you can rest assured that in the game there is room for everything and so will have a good dose of humor, although like the rest of the adventure, this is somewhat peculiar. 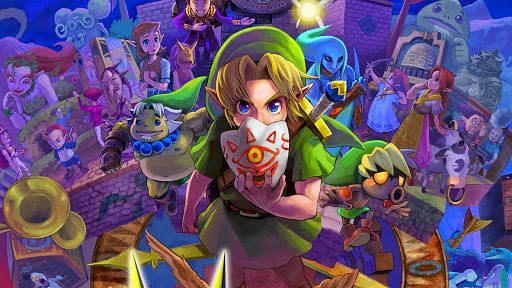 The other big differentiator Majora's Mask is offered by the use of masks. In total there are 24 different, divided between masks and face shields. The first Link will transform completely, allowing us to obtain new tools, features and unique skills to which we must learn to take advantage of them and they add a lot of variety development since the end feel like we were controlling four completely different characters (five if you count the secret mask). In regard to the masks, they don’t transform us, but have very different effects, allowing us to enjoy certain skills and trigger events and conversations that would otherwise never discover. They come in many different types and they all have their role in the game (mostly for secondary and optional events). Moreover, as with the masks, depending on which to relocate the start, people will look at us and interact very differently with Us form. Otherwise, the game is a 3D Zelda 120% step by step following the teachings of Ocarina of Time, offering the same kind of dungeons, puzzles, controls (automatic jump, Z-targeting ...), use of objects , fighting and exploring the world, so you will feel at home cutting grass, breaking walls cracked bomb, looking weaknesses of enemies, and so on. Yes, we must emphasize that the difficulty is somewhat higher than usual in a 3D Zelda, with tougher bosses and enemies able to get us a good amount of hearts (luckily, get bottles to catch Fairy is easy, so dying is quite rare). We would also like to note how well designed dungeons are: long, labyrinthine, challenging, full of secrets and to some extent very original. Complete the main quest will take about 12 to 15 hours, but if you limit only to follow the plot will miss much of the essence and magic of the game, so I highly recommend that before going to the final battle we recommend at least you take time to discover all the stories and the potential that hides Majora's Mask. There are dozens of mini-games to enjoy, and challenges and unique situations that deserve to be discovered, so do not miss them. So far, everything we have said could be applied perfectly to the Nintendo 64 version, but if you are of those who enjoyed game 15 years ago probably you might be wondering if there is something new on Nintendo 3DS. The answer to this would be "yes and no". In essence we are faced with virtually the same game, but with minor tweaks here and there to polish the experience of one form or another. To begin, note that you have changed the save system. Earlier in Nintendo 64, the only way we had to save the game was constantly returning to the first day, whereas now we will find a series of statues spread around the world allow us whenever we want to save. They are of two types, ones that only serve to record our progress and others also may use as a fallback to teleport to them using certain song. True, this makes things a bit, in the sense that we can keep in the middle of one of the days, and if an activity leave us bad or we go from hour to load from there the game and try again without to repeat it all again, but if you prefer to play and Nintendo 64, it just will simply not keep these points and save the game every time you back away at the statue located in the center of Town. Moreover, we have added a new fishing minigame, much like what is seen in Ocarina of Time, but with the peculiarity that depending on the time, day and mask we use, we can get a fish or another, so we'll have to end up dedicating a lot of time if we are to achieve anything. One of the most striking developments we have in the redesign that has suffered the Bombers' Notebook. One of the biggest "problems" that had the Nintendo 64 version for its producer Eiji Aonuma, was that the game offered very little information about events and subplots Termina, so many people ran out of them all, something who wants to rectify this time. So now whenever we meet someone new or participate in an event that could trigger something else, will be recorded in our book (and even their schedules) for us to be well aware of them and there are things that still need to fulfill. Until we can use it to set alarms, although the latter function we have not been particularly helpful. In addition, the boys of Bomber offer us all kinds of rumors (tracks rather) so that we know where there's always things to do and secrets to discover. Continuing with this set of tracks, now also added a stone giant Sheikah within Clock Town will give us different indications about our next goal (which is entirely optional use). Another aspect that has been retouched is the Chief. It was said that at least one of them redesign, but the truth is that we have found that virtually all of them have been modified in one way or another, adding a new weak spot shaped like a giant eye that we must learn to exploit, varying the field of battle, making them longer, and so on. He who has undergone major changes is Gyorg, the final boss of the third dungeon, which now offers a much more challenging, fun and complicated that we live in N64 battle. The game is also compatible with the new Nintendo 3DS New buttons and even its lever C, allowing us to use the two extra buttons to equip items and the lever to move the camera freely. The truth is that the original game was designed to play without a second stick, so if you do not have New Nintendo 3DS know that the game is still controls a blast and not cast him out at fault, since even equipped items on buttons may use the additional from the touch screen (we recommend equipping mask here for convenience). Speaking of the bottom screen of the console, saying that in addition to using objects, the title used to show the map and to allow us to manage inventory with greater speed and precision, something that eventually end up saving us a long time. These are the changes "major", although there are also a number of other "minor", it may not look it, but is appreciated, as the new location to store our bank rupees and not lose them to return to the first day , now located in the central part of Clock Town or redesign wins Song of Double Time, now instead of taking only the sunrises and sunsets, allow us to choose the specific time at which we move forward. Taking this opportunity, Nintendo has not been limited to offer the same game 15 years ago in portable version and with a few changes, as it also brings with visuals completely renovated and getting it look so much higher than the version Nintendo 64. Perhaps in images and screenshots not notice much, but we assure you play live on a Nintendo 3DS is a far superior to that seen in its original experience. All elements and textures have been redone from scratch (without losing its essence and always remaining faithful to that seen in Nintendo 64), so the scenes look great, the character models are much more detailed, better animated and feature with many more polygons (although still hands with fingers "glued") and the speed at which moves everything is a treat. Accustomed to 20 fps from the original version, see how far the title moves as smooth is quite great pleasure and enjoyment, but we must warn you that have detected more downs in the rate of frames per second than we like, some of them quite noticeable. 3D effect, simply say that this is one of the most accomplished we have seen in the console, with a pronounced depth and even gets plump your characters and elements of a more than satisfactory manner. Finally, the sound gets a great soundtrack from its original version, with so recognizable and memorable as themes Clock Town, the Palace of the Deku or battles against bosses, it will cost you remove them from you in the head when Quench the console. The effects remain the same as always and maintaining a good quality while dubbing still absent beyond the cries of Link and some noises and moans that make characters that we meet. Luckily Taya, the fairy who accompanies us on this occasion, not torment us with continuous "Hey, Listen!". As we said at the beginning of the text, The Legend of Zelda: Majora's Mask is a unique and unrepeatable game, the kind that even 15 years later still keeping fit and making us enjoy like the first day. Such a magical adventure that since its launch has not seen anything similar, even within the series itself. Is probably the most bizarre, dark and different Zelda going to have the pleasure of playing, and changes in this version are introduced carefully and don’t worsen the experience, on the contrary, a little more polished.